...does show the correct date, but no complete picture at my equipment. 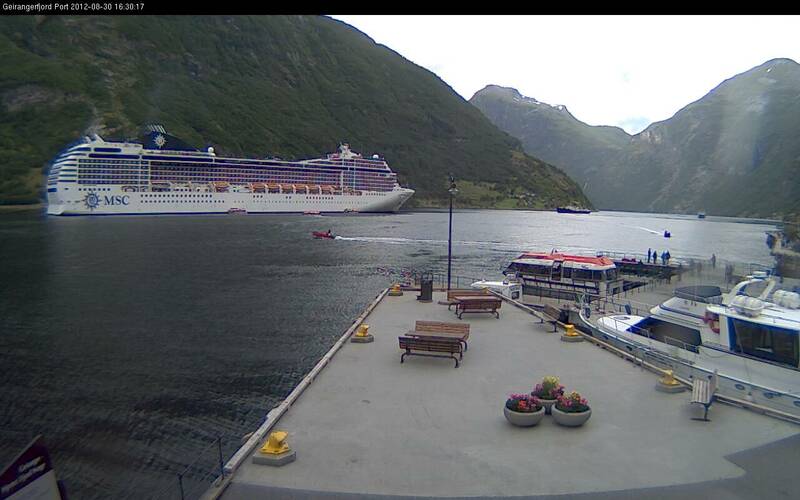 Can somebody try to open this link: http://www.stranda-hamnevesen.no/Webcams and let me know if it works? I can open the link, but the pictures from all three cameras are "frozen" or non-existent on my computer. Last edited by Sarnia; August 30th, 2012, 16:00. (You need to update the whole page, otherwise the date stamp changes but the image itself is not updated, apparently). Last edited by Sarnia; August 30th, 2012, 16:19. Yes, there she is. Nice catch, Sarnia!! Marinetraffic still shows her as anchored, she is moving around a bit. Onother classic visitor can be seen in Hellesylt now: Marco Polo. I got the pictures back as well. Thanks for restarting Sarnia!!! Great captures everyone! Yes we are still at anchor. i am just back onboard NX and our Polar Cirkel boats are busy tendering. After great weather all day the forecast rain has just arrived here and the rapidly changing light on the fjord and the mountains is beautiful to see...even as I type this the sky lightens once again. I meant to add that after the magnificent ascent of Trollstigen, our excellent guides and driver from Ålesund got us to the Eagle Road viewpoint just in perfect time to see NX appear from around the bend in the fjord. The patterns of the bow wave in the dark water was exquisite and I am VERY delighted with my photos! Met up with ArcticGateway who was waiting on the quay to photograph the ship's arrival. Nice addition, thank you for your work. And we can clearly recognize our Cecilia and "her" David. Good to see you can now post on the forum arcticGateway, though I'm not seeing a photo! But I DO like those inverted commas in your post Ralf, me having to put up with Neptune himself as cabin mate! . though I'm not seeing a photo! The default method to insert a video by using the video button doesn't work on an iPad. As I have seen some videos in this forum on my iPad there surley is another way to insert videos, but I don't know how? That's a really nice video! I like that you keep it so simple, but not too long. It's probably best I'm not staying in Bergen. I would only be moping around the quay missing NX. But I did have a treat this morning...Discovery was arriving just in front of NX and I hadn't even realised in advance! I heard that NX may be leaving Munkebryggen around noon (though I have no definite knowledge of where to). 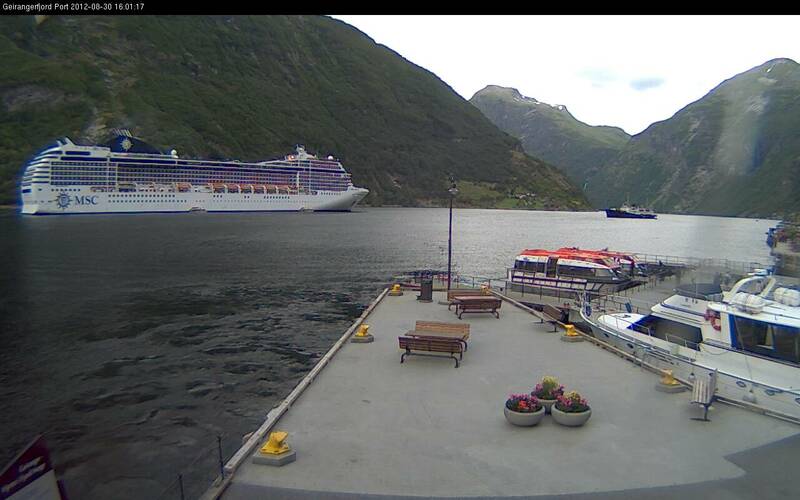 Might be worth checking the Fløyen webcam.